This exhibition presents art that is modern in date and belongs to an artistic tradition that can be traced back fifty thousand years. Australian Aboriginals have long painted on bodies, rocks, and the ground as part of ceremonies. Since the early 1970s, they have also been making large rectangular paintings on canvas and other durable artworks to sell to people outside their communities as a way of gaining recognition and respect for their laws and sacred beliefs. The exhibition title—Ancestral Modern—expresses how these transcultural artworks embody both the old and the new in this extraordinary tradition. 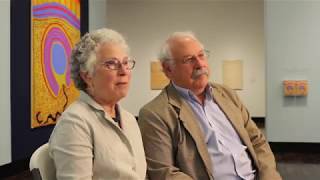 The Seattle-based couple Robert Kaplan and Margaret Levi have avidly acquired Australian Aboriginal art together since 1991. This exhibition shows selections from their collection and comprises paintings on canvas and eucalyptus bark and logs, plus a small number of sculptures made of grass, stoneware, and wood. Ancestral Modern opens with landscapes painted in Papunya, the desert community where the contemporary Aboriginal art movement started, and then takes us on a journey to other places, including Balgo, Fitzroy Crossing, Utopia, and Yuendumu, where the movement has expanded and diversified. The artists typically belong to Aboriginal-owned art cooperatives that provide materials, studios, and galleries to exhibit and sell their work. Kurtal (2005) exemplifies how each work of Aboriginal art encompasses a wealth of cultural, ecological, and ritual information. Ngilpirr Spider Snell’s brightly colored canvas is a pulsating desert landscape with a waterhole—represented as a refreshing, cool azure circle—at its center. The Snake Spirit Kurtal slithers below. Wearing long headdresses, the artist and other elders danced and sang at Kurtal’s waterhole to celebrate the beginning of the rainy season. In the painting, rain clouds, depicted as orange arches in the sky, nourish the land, which is filled with the dense dotting of bush onions. Before his death in 2016, the artist focused on passing his community’s sacred ceremonies to his descendants, who had largely lost their connections to the land. Prior to the arrival of English settlers in Australia in 1788, Aboriginal people amassed a profound and intimate knowledge of the continent. Their art reflects an intense respect for nature and a desire to live in harmony with it. Common subjects include crocodiles, emus, kangaroos, and other animals unique to Australia, and traditional Aboriginal dietary staples, such as bush plums and desert raisins. Much of Australia is arid, and the precious waterholes around which Aboriginal life revolves, such as the one represented in Kurtal, are another recurring theme. The immersive canvases and beguiling sculptures in Ancestral Modern invite us to look at Australia from the distinctive point of view of its Aboriginal people. Their depictions of their worldview made for a global audience remind us how awe-inspiring nature can be, wherever it is encountered. Non-flash photography is allowed in this exhibition. This exhibition is organized by the American Federation of Arts and the Seattle Art Museum. It was made possible by the generosity of Mrs. Donald M. Cox, the Wolfensohn Family Foundation, and an anonymous donor.